‘We’ are happy that you clicked the Application. There’s nothing truer in Nature than seizing the moment. Now you get to act on that moment via some mindful breathing as you let 'uss' in on who you are and what you desire. This application is designed to allow you to answer intuitively as well as analytically. Feel free to answer either way, preferably both, and save a copy for yourself. Please do your best to leave out judgment, blame & shame which never serve us well. To assist you, here are more Secrets of the Serpents in addition to those offered in our Free Gift Opt-in available on Home page. Serpent Secret # 3: Intuitive thoughts communicate as images much easier than analytical thoughts to Snakes (and most animals). Plus images allow for fluid manifestation as Emotions are generated kinesthetically rather than literally. Serpent Secret # 4: Snakes have no capacity or attachment to judgment, blame or shame as this is not an advantage in Nature. They live from moment to moment or on a journey of the moment, if you will. 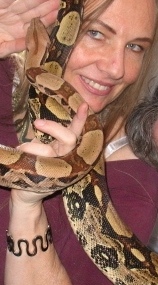 VIP Snake Immersion Retreat: Embody Your Wild Divine Life! Please note that due to time commitments plus the health & welfare of the Snakes, not all applications can be accepted. But you will be notified that your application will remain on file for a future time. What Life Stage are you currently living? Are your Spheres of Influence: Life, Relationships, and Career in a balance that serves the Stage of Life you are living? Do you believe and feel you are living with your inner-life purpose aligned within your outer-life purpose? Indicators are: you value your outer-life purpose and you feel your life is being lived meaningfully. What role has your intuition (gut instincts or inner wisdom) served in your life? Do you approach your dreams, goals, and accomplishments primarily analytically? What compels you to evolve your focus and capacity to meet a challenge? Do you struggle with inertia? What is the percentage of your success or competence with filtering out distractions, internal or external, so that you can focus on the task at hand? Do you have an ongoing Mindfulness Meditation practice in your life? Other personal practices, ie; yoga, art, music, movment? How do these practices serve you best? Do you trust your gut instincts or intuition to discover hidden opportunities? How aware are you of the intentions and motivations that are sub-consciously influencing your Life choices? Are they serving you well? Have you ever wondered afterwards "why did I do/say that?" during an emotional situation? In which life sphere does this occur the most? Who are you becoming? What are you creating in your Life, your Relationships, your Career? Do you feel the pulse of the Divine flowing through you? Are you living your Wild Divine Life? Are you thriving, feeling Desire, living a meaningful life? Or just surviving? Are you ready to evaporate Inertia, embrace your Gut Instincts and align intuitively within Nature’s mysteries? To assist you, you can reference your Free Gift document. When you think about dying, do you think about Renewal? Or do you focus on the end of everything? How do you shed/release what no longer works in your life? Do you recognize that you are energetically shedding/releasing/dying the little death, regardless of your cognitive input? 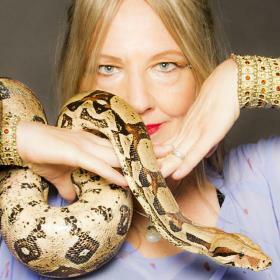 What do you see as the benefits of working with the Snake teachers and receiving their mystical healing and natural support? What does that look & feel like for you? Which Outcomes/Benefits are you most focused upon receiving? On a scale of 1-10 (10 being highest), How willing and ready are you to significantly invest emotionally, energetically, and financially into becoming an even greater expression of yourself? What do you feel are the benefits of becoming the greatest expression of yourself? Have you ever worked with Snakes or Serpentessa's Snakes or any other animal teachers before? What kind? What did you receive? What have you implemented into your life today from that previous experience?